From the time she is nine years old, biking to the farmland outside her suburban home, where she discovers a disquieting world of sleeping cows and a “Private Way” full of the wondrous and creepy creatures of the wild-spiders, deer, moles, chipmunks, and foxes-Lauren Slater finds in animals a refuge from her troubled life. As she matures, her attraction to animals strengthens and grows more complex and compelling even as her family is falling to pieces around her. Slater spends a summer at horse camp, where she witnesses the alternating horrific and loving behavior of her instructor toward the animals in her charge and comes to question the bond that so often develops between females and their equines. Slater’s questions follow her to a foster family, her own parents no longer able to care for her. A pet raccoon, rescued from a hole in the wall, teaches her how to feel at home away from home. The two Shiba Inu puppies Slater adopts years later, against her husband’s will, grow increasingly important to her as she ages and her family begins to grow. Slater’s husband is a born skeptic and possesses a sternly scientific view of animals as unconscious, primitive creatures, one who insists “that an animal’s worth is roughly equivalent to its edibility.” As one of her dogs, Lila, goes blind and the medical bills and monthly expenses begin to pour in, he calculates the financial burden of their canine family member and finds that Lila has cost them about $60,000, not to mention the approximately 400 pounds of feces she has deposited in their yard. But when Benjamin begins to suffer from chronic pain, Lauren is convinced it is Lila’s resilience and the dog’s quick adaptation to her blindness that draws her husband out of his own misery and motivates him to try to adjust to his situation. Ben never becomes a true believer or a die-hard animal lover, but his story and the stories Lauren tells of her own bond with animals convince her that our connections with the furry, the four-legged, the exoskeleton-ed, or the winged may be just as priceless as our human relationships. 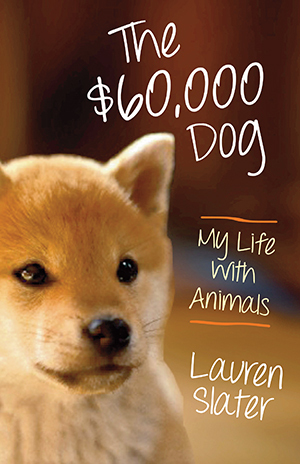 The $60,000 Dog is Lauren Slater’s intimate manifesto on the unique, invaluable, and often essential contributions animals make to our lives. As a psychologist, a reporter, an amateur naturalist, and above all an enormously gifted writer, she draws us into the stories of her passion for animals that are so much more than pets. She describes her intense love for the animals in her life without apology and argues, finally, that the works of Darwin and other evolutionary biologists prove that, when it comes to worth, animals are equal, and in some senses even superior, to human beings. "It's the fearlessness along with the beauty that makes "The $60,000 Dog" a work of lasting achievement." "A thoughtful memoir unravels the depth of our animal attachments." "Edgy, revelatory, disturbing, and beautifully written, Lauren Slater's The $60,000 Dog is too unsentimental and idiosyncratic in structure to be lumped in with more traditional animal books. Lassie Come-Home, even Marley and Me, this is not. "A thoughtful examination of a sometimes difficult life, ameliorated and often alleviated by connections with nature and animals. . . .Dogs, wasps, and bats also figure in a poetic narrative that gives the reader a melodic look into a deeply considered life." "A revealing, often surprising memoir . . . Slater continually surprises with connections she makes. Beautifully written, and not just for animal lovers."